The Bombardier CRJ200 cockpit contains two pilot seats and one jumpseat. Two yoke control columns provide pitch control. One of the main focus points in the CRJ200 cockpit is the avionics system. 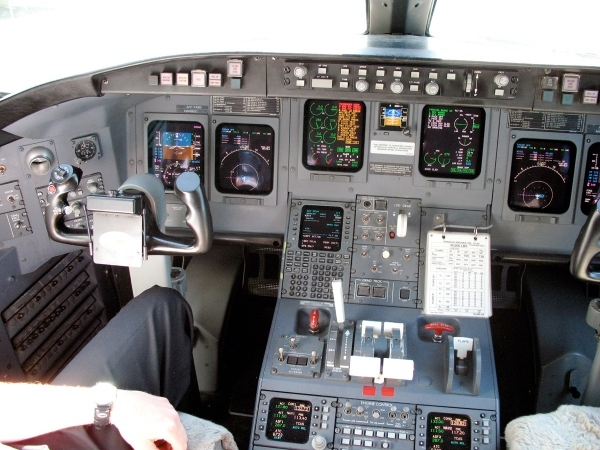 The Bombardier CRJ200 flight deck avionics are powered by Rockwell Collins Pro Line 4 avionics suite. Six tube style displays make up the main avionics displays in the CRJ200 cockpit. A center console is located in the middle of the CRJ200 cockpit, that houses the FMS units, throttle controls, flap controls, radio controls and various switches and buttons for other items. The CRJ200 flight deck can also contain a head up display or HGS unit, an optional item that is not on all CRJ200s. A nose wheel tiler of nose wheel steering wheel is located on the left side of the Bombardier CRJ200 cockpit. Above Bombardier CRJ200 Flight Deck photo by Dmitry Denisenkov on Wikimedia Commons. Photo (only) released under a Creative Commons License. The Bombardier CRJ200 cockpit - flight deck is also known as the Bombardier CRJ-200 cockpit - flight deck, Bombardier CRJ 200 cockpit - flight deck, Bombardier CL-65 cockpit - flight deck, Canadair CRJ200 cockpit - flight deck, CRJ200 aircraft cockpit - flight deck, Bombardier CL-600-2B19 cockpit - flight deck and the Bombardier CR2 cockpit - flight deck.